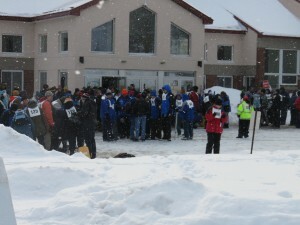 Teams gather in front of CBNA’S Smith Hall for Opening Ceremonies. On Saturday, February 7th, Coe-Brown Northwood Academy hosted the 2015 Special Olympics of New Hampshire Seacoast Area Winter Games. A proud tradition for about a decade, these games were finally held again after three years of cancellation due to lack of snow and poor field conditions. About 200 Special Olympics athletes from many teams around the state competed in cross-country ski and snowshoe events ranging from 10 to 7,500 meters in length. Event coordinator and faculty member Shawn White and Special Olympics Field Coordinator Miranda Morse would like to thank the many Coe-Brown faculty, staff, and student volunteers whose efforts both ensured and enhanced the success of this event. They would also like to thank the Northwood Crankpullers Association for helping to pack down snow on the race tracks, and Bryana Clark of Exeter, our current Miss New Hampshire Teen National, for joining us. We look forward to next year’s games.